On hatching, loggerhead turtles make a beeline under cover of darkness from nests in the sand to the open ocean. The turtles will return to the same beaches perhaps a decade later, when they have grown 10-fold: born barely bigger than a slice of pepperoni, they arrive the size of a large pizza. 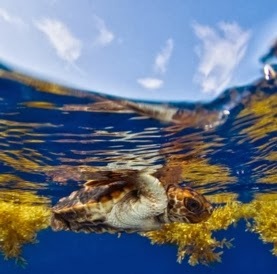 The time in between is known to marine biologists as the turtles' "lost years." Exactly how the juveniles spend their time during those years and how they survive has remained a mystery for decades. Now, borrowing a tip from a manicurist, researchers have determined that the turtles do not quite go where they thought and have new clues on how they grow. This new window into sea turtle behavior comes as a result of scientists conquering a technological question: how to attach satellite tracking tags to very young, fast-growing turtles. A research team based in Florida now has maps of the reptiles' travel on the first long leg of their journey, they reported on March 5 in Proceedings of the Royal Society B.